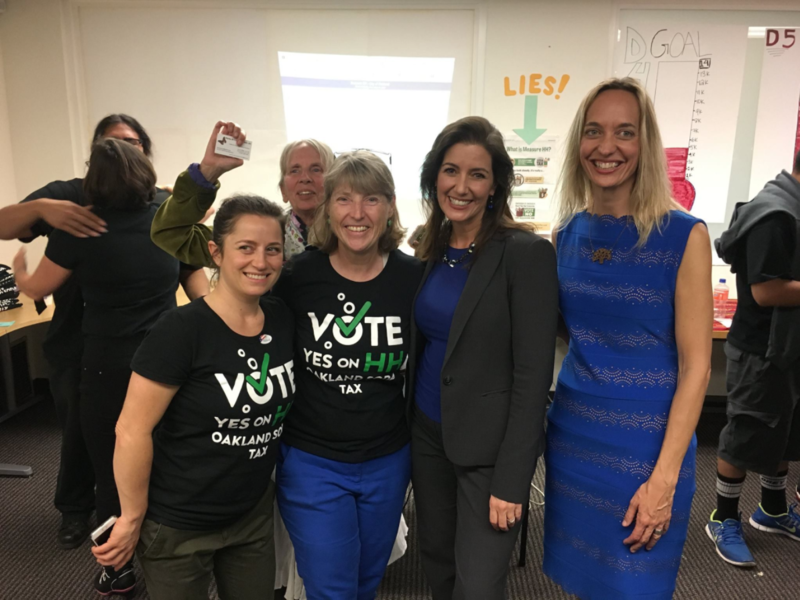 Oakland Mayor Libby Schaaf with Councilmember Annie Campbell Washington at a sugar-sweetened beverage tax campaign event last year. Several Oakland councilmembers are accusing Mayor Libby Schaaf of trying to divert soda tax revenue away from health programs, as voters were promised. The councilmembers, who were briefed on the mayor's proposed budget yesterday, claim Schaaf wants to put the revenue in the general fund to close the city's expected deficit. In a Facebook post published last night, Councilmember Desley Brooks called the mayor's plan a "bait and switch." Councilmember Annie Campbell Washington also wrote in a Facebook post that she is "deeply offended the proposed budget redirects revenue from our new Sugar Sweetened Beverage Tax for other priorities." Councilmember Rebecca Kaplan is also publicly criticizing Schaaf's plan. All three say they'll take action to prevent the diversion. But Schaaf spokesperson Erica Derryck wrote in an email that the mayor's proposal on how to spend the soda tax revenue is "consistent with the goals of the measure." "This supports a variety of services proven to impact the social determinates of health from educational attainment to healthy neighborhood environments and public outreach and education," she wrote. Derryck's statement acknowledged that the advisory board to oversee Measure HH revenue hasn't been established yet. The mayor's budget proposal will be made public later today. Opponents of the soda tax, including the American Beverage Association, campaigned against it by warning voters that the money would be deposited in the general fund, and city officials could spend it on anything. The City of Berkeley also passed a soda tax, in 2014. Holly Scheider led the Berkeley Healthy Child Coalition, and getting soda-tax money from the city's general budget was never an issue. It had unanimous council support, like Oakland, and they set up their advisory committee almost immediately to formalize the process. "Like in Oakland, it went to the general fund, but it was really a promise made to voters," Scheider told the Express. While some of Berkeley's soda tax money goes to the city's health department to cover overhead, $1.2 million of this year's revenues were split between Berkeley school district programs and nonprofit groups focused on reducing the risks of diseases linked to the consumption of sugar-sweetened beverages. Scheider said Oakland should set up their advisory council immediately to assure the money goes to its intended purposes. "Mayor Schaaf is within her legal right to do this, but hopefully it won't go through because there was a promise to voters," Scheider said. Additional reporting by Brian Krans.